With new and innovative technology becoming available every day, perimeter security companies have grown in popularity. With new advancements in smart technology, adopting a perimeter security system has never been easier or more efficient. High-resolution cameras, motion sensing technology, advanced low-light imaging, remote monitoring, and a wide range of other functions make modern security cameras the ultimate security solution for gated communities. New perimeter security solutions provide a powerful proactive layer of defense against an uncertain world. In recent years, HOA gated community security plans include hiring perimeter security companies to provide a watchful eye over every corner of a property twenty-four hours a day. Most property owners and especially gated communities understand that keeping vigilant watch over the sometimes miles of gates that protect the property is necessary. Criminals recognize the difficulty these communities have in maintaining constant surveillance of these gates and can exploit these vulnerabilities. Perimeter security companies can remove these vulnerabilities all-together, which is proven to consistently deter criminals. 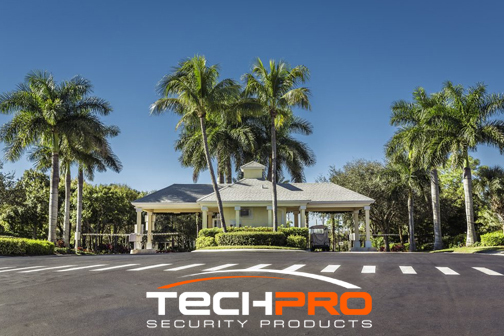 TechPro Security Products is South Florida’s top-rated and number one security installation team that can provide a comprehensive perimeter security solution for gated communities. By using the latest in state-of-the-art surveillance technology, we can incorporate outstanding live remote monitoring services of remote security guards and create a truly proactive perimeter security solution. Our team of experts believes the most important priority is the safety and well-being of our customers and clients. Using up-to-date remote surveillance techniques coupled with bleeding-edge security cameras that use the latest technology, a proactive perimeter security plan is no longer out of reach but instead is very possible and affordable. The peace-of-mind that skilled and expert security professionals from perimeter security companies can provide is absolutely priceless. The moment one of these professionals is alerted of suspicious activity anywhere near the perimeter, they can act quickly and decisively. We believe a comprehensive perimeter security solution should not only be efficient but cost-effective while providing preemptive and decisive action to protect our clients’ property and assets. As one of the top South Florida perimeter security companies, TechPro Security understands the inherent difficulty of protective large communities, especially covering every corner and blind spot. In the past, surveillance technology was limited by power requirements, poor imaging equipment, and lighting conditions, which allowed criminals to exploit these vulnerabilities. TechPro Security Products utilizes only the most advanced and capable security surveillance equipment and take advantage of smart technology and intelligent features. Whether it’s solving power requirements using solar-powered technologies, employing wireless IP network surveillance systems, or using thermal imaging technology, we can guarantee that perimeter security has never been so successful. We partner with an esteemed South Florida leader in remote video monitoring services that can provide peace-of-mind day or night. Digital Security Guard is a professional remote surveillance monitoring service with trained security specialists providing live perimeter security management. From a central location, Digital Security Guard monitors properties and gated communities while working closely with local law enforcement and emergency services to ensure a timely and decisive response. Live remote monitoring is an incredibly affordable and surprisingly efficient security investment than live, on-site guards. TechPro stands apart from other perimeter security companies when it comes to the excellence of our work using the latest state-of-the-art technologies. We are proud to use our work with The Oaks gated community in Boca Raton, Florida as a testament to our outstanding commitment to providing piece-of-mind, no matter the scale of a property or in this case, a gated community. The Oaks is a one-hundred percent custom solution designed specifically for the security needs of the community. We are extremely humbled to have been accepted to create the most advanced perimeter security system of any community anywhere. This perimeter security solution uses military grade long range thermal cameras. These include high-resolution 8 MP IP cameras and advanced cutting-edge analytic technology, all within a single comprehensive security solution unlike any other provided by perimeter security companies in the region. We are proud of the comprehensive perimeter security solution we have created for The Oaks and it is a testament to the advanced nature of modern security surveillance equipment and TechPro’s commitment to providing cutting-edge security solutions. The work done at The Oaks represents the future of perimeter security. Comprehensive perimeter coverage of the entire neighborhood which is monitored twenty-four hours a day by our partnership with remote surveillance monitoring services by Digital Security Guard. Using a working relationship with local law enforcement allows the Palm Beach Sheriff Department to be alerted the moment a perimeter intrusion is detected followed by alerting The Oaks security personnel. Installation of license plate recognition and capture surveillance cameras using advanced software at every entrance and exit. Every vehicle’s license plate image will be captured and can be analyzed for discrepancies. Every guest entrance will also employ facial recognition technology and software to monitor guests leaving and entering the community. The on-site security personnel will work hand-in-hand with Digital Security Guard which will monitor and report all foot traffic that enters the community of The Oaks. The on-site security guards will use this monitoring service to ensure everyone is authorized to be there. The security cameras installed at the community will employ ultra-high resolutionhttps://www.techprosecurity.com/video-monitoring-servicemonitoring Starlight 8 megapixel cameras. These will be deployed along the main artery of The Oaks and can capture high-definition imagery in a number of conditions including low-light. Hurricanes can cause major power outages for any gated community for this reason TechPro is providing disaster recovery backup power for all security cameras, gatehouses, and gate power operators when power will be out for an extended period of twenty-four hours. Digital Security Guard will utilize our custom designed emergency remote gate operators to allow their security experts to remotely screen visitors and allow or deny entry just like a physical security guard. This is an important feature used in the event that a natural emergency prevents the on-site security personnel from reporting for duty. Using a Heartbeat Server we will be able to monitor the condition of every individual camera, recorder, and hard drive and send a technician in the event a repair is required. In the event of a long-term power outage, TechPro will install backup monitoring stations to allow the on-site physical guards to continue monitoring the perimeter. Unlike other perimeter security companies, TechPro Security will be performing monthly drills to further train and improve reaction times for not only the local The Oaks security guards but also our partners at Digital Security Guard.